This is a beginner work-out that focuses on toning and building lean muscle mass. This work-out is suitable for all fitness levels and is recommended for any one looking to tone up and shed some excess body fat. The dumbbell step-up is a beginner lower body exercise. 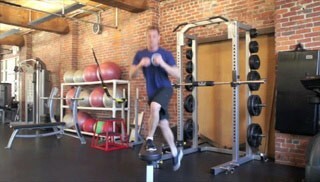 This is an excellent compound exercise that targets the quads and buttocks. The seated row is a beginner back exercise. This exercise builds and strengthens the muscles of the mid and upper back. The dumbbell chest press is an intermediate chest exercise. The exercise uses the stability ball to increase the level of difficulty and the dumbbells to allow the arms to work independantly from one another. Both of these elements help to enage and challenge the core. The heel kicks are a beginner exercise that really targets the glutes. This exercise is an excellent way to build up and tone the buttocks. The ab crunch with stability ball is a challenging core exercise that targets the abs. This exercise is suitable for all fitness levels. 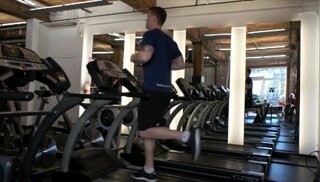 Running on the treadmill is a great option for interval training. The step overs on the bench are a beginner exercise that really target the quadriceps and muscles of the outside of the hip. This exercise is excellent for toning the hips and building strength in the legs. This is a shoulder exercise that trains the front of the deltoids. This exercise uses the Theraband for constant resistance throughout the entire range of motion. The exercise band tricep extension is a beginner upper body exercise. This exercise targets the triceps and is a great exercise for all fitness levels. The open arm chest raise is a beginner level core exercise that targets the lower back.